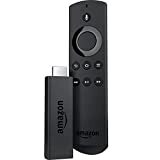 After all this time, the Fire TV Stick with Alexa Voice Remote is still the best-selling streaming media device on Amazon. In fact, believe it or not, it’s the best-selling device in the entire electronics department. There are hundreds of thousands of gadgets and gizmos on Amazon, and the Fire TV Stick outsells them all. Why? Because it’s super affordable, insanely convenient, beyond easy to use, and it works with thousands upon thousands of different apps, games, and services. With a 4.6-star rating from more than 75,000 customer reviews, the Fire TV Stick may be the most universally loved product on Amazon.